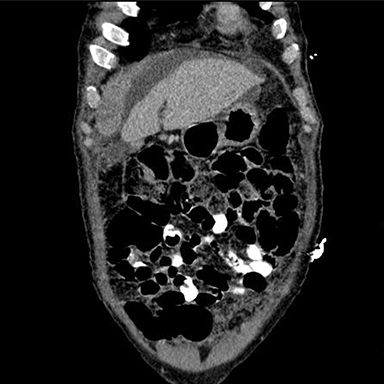 A 50-year-old male with history of cirrhosis secondary to Hepatitis B and C and treated multiple myeloma presented to the emergency department with abdominal distension, confusion, and lethargy. Biochemical investigations were significant for azotemia, hyponatremia, thrombocytopenia, and anemia. A contrast-enhanced computed tomography (CT) examination of the abdomen and pelvis was compared with a CT angiogram of the chest performed two weeks earlier and showed interval development of a 4.5 cm enhancing soft tissue mass in the right upper quadrant, anterior to the liver (Figure 1). Additional areas of involvement included Gerota’s fascia on the left and the paracolic gutters bilaterally. The skeleton showed both lytic and blastic lesions (Figure 2). CT-guided biopsy was obtained. Ascitic fluid and core biopsies of the suspicious soft tissue mass were submitted to pathology for analysis (Figure 3). Multiple myeloma typically presents with lytic lesions in the axial skeleton, but may also present in the long bones. Extramedullary disease occurs less frequently, but may occur in the peritoneum, lungs, liver, or lymph nodes, to name a few locations. Radiographic bone survey is used to screen for lytic lesions, but is less sensitive than MRI in the spine. PET-CT can be used to establish a baseline distribution of disease, as well as to monitor response to treatment. Howlander N, et al. SEER Cancer Statistics Review, 1975-2011. 2014 [cited 2015 3/23/2015]. Hess T, et al. Atypical manifestations of multiple myeloma: radiological appearance. Eur J Radiol. 2006;58(2):280-285. Birjawi GA, et al. 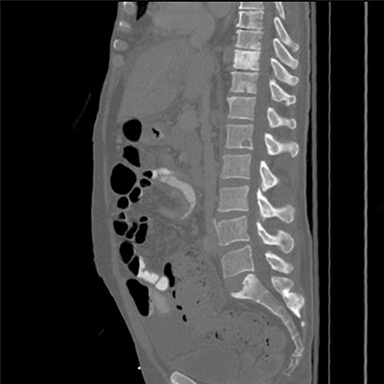 Abdominal manifestations of multiple myeloma: a retrospective radiologic overview. Clin Lymphoma Myeloma. 2008;8(6): 348-351. 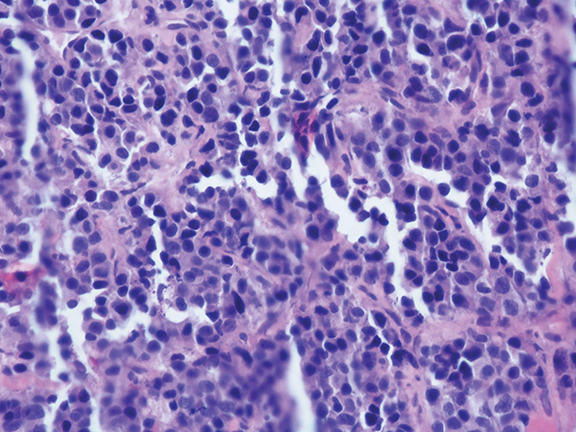 Karp SJ and Shareef D. Ascites as a presenting feature multiple myeloma. J R Soc Med. 1987;80(3):182-184. Monill J, et al. CT features of abdominal plasma cell neoplasms. Eur Radiol. 2005;15(8):1705-1712. Angtuaco EJ, et al. Multiple myeloma: clinical review and diagnostic imaging. Radiology. 2004;231(1):11-23. Ferraro R, et al. MR imaging and PET/CT in diagnosis and management of multiple myeloma. Radiographics. 2015;35(2):438-454. Lecouvet FE, et al. Skeletal survey in advanced multiple myeloma: radiographic versus MR imaging survey. Br J Haematol. 1999;106(1):35-39. Dimopoulos M, et al. Consensus recommendations for standard investigative workup: report of the International Myeloma Workshop Consensus Panel 3. Blood. 2011;117(18):4701-4705. Lather JD, Coker MF, Varshney N, Coombs RJ. Multiple myeloma with peritoneal metastases. Appl Radiol. 2016;45(11):42-43. Prepared by Dr. Lather while a Resident in the Department of Radiology; Dr. Coker and Dr. Varshney while Residents and Dr. Coombs while an Associate Professor in the Department of Pathology, University of Toledo Medical Center, Toledo, OH.